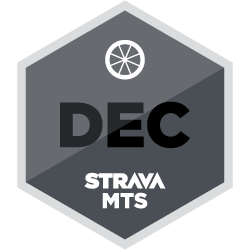 How many kilometers can you ride this December? Open every month, our Monthly Training Series (MTS) is there when you need an extra challenge. Whether you start the Challenge at the beginning of the month or join in the last week, set yourself a distance goal and and make it happen. Regardless of the weather, the time of year, or your other commitments, get out there this month and prove that no one loves riding more than you do. If you achieve the 1,250 km milestone, the badge will appear in your Trophy Case.